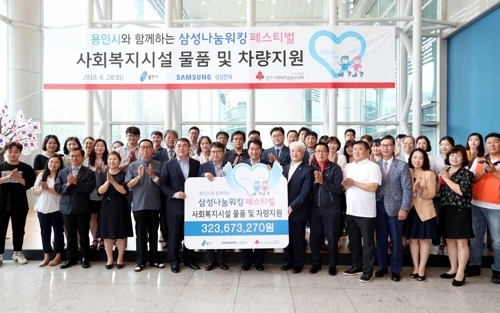 Samsung Electronics is expanding its corporate social responsibility projects targeting local communities to achieve sustainable development and promote the raising of funds for a good cause. The Nanum Walking Festival is one of the company’s projects aimed at helping the community. Under the program, the company donates the same amount of money donated by participants of the event. Since 2013, a total of 15,700 people have participated in the annual event held in various parts of the country, raising 1.5 billion won ($1.35 million) over the last five years. The funds were spent on buying products and vehicles for 98 welfare service facilities across the country, the company said. Projects are held jointly with municipalities to raise awareness as well. For instance, Yongin City has donated air conditioners, computers and cars to 35 community service centers in the region with the funds raised through the Nanum Walking Festival last year, the company said last week. The city and the company’s device solutions division have raised a total of 320 million won together by selling tickets of the festival at 5,000 won each. The full-day event includes an hourlong walking program and performances by artists and celebrities. There will also be family friendly programs, such as face painting and bubble art, according to the company. Yongin City, in association with Samsung, plans to hold the event on Oct. 6. The festival is also set to be held in four other cities: Pyeongtaek, Gyeonggi Province, on Sept. 15, Suwon on Oct. 20 and Hwaseong on Sept. 8. A separate event will take place in Asan, South Chungcheong Province, on Nov. 3. For those who wish to participate in the Nanum Walking Festival, visit www.samsungwalking.com to register.